Amar'e Stoudemire is out "indefinitely" with a bulging disk in his lower back, the injury that makes broadcasters quiver with fear. This has led to all sorts of doomsaying this morning. Let's take a look at what we know, what we don't, and what the Knicks are gonna do now. First off, just how long is he out? What does "indefinitely" mean? It means they have no idea. He's getting a "second opinion" on the bulging disk in Miami today; apparently they are experts on bulging disks in Miami. So it all comes down to which report you trust. Tommy Dee at the Knicks Blog says he's only hearing a week or so, which would be glorious and the best-case scenario. The worst-case scenario is that it's a month, or even more, or that Stoudemire doesn't respond well to treatment and ends up needing surgery. Either of those scenarios probably puts Amar'e out for the rest of the year. Remember, there are only seventeen games left, and the season ends on April 26, exactly one month from yesterday. You'd theoretically need to get Amar'e back for at least a couple of games before the playoffs start to work his way back in. But even that may be optimistic. Point is: Nobody knows. While he's out, who's going to pick up more minutes? The white guys! As long as Jared Jeffries remains out — and he's looking at another week and a half at least — it'll be Steve Novak and Josh Harrellson who grab the extra time. Harrellson is the theoretical "center" who will pick up fouls and play solid defense (far better defense than Amar'e, it must be said), and Novak will be the four in small-ball sets. Novak so far has mostly been the three-point specialist who is just supposed to avoid disaster on the defensive end. He'll be asked to do more than that now. It would seem lots of small ball is coming, yes? Without question. (Good question, us.) Last night had a lot of Davis/Shumpert/Fields/'Melo/Chandler, and one should get used to that, Fields playing the 3 and Carmelo at the 4. It's not ideal, but note that the Eastern Conference is not exactly full of bruising big men who will post up and knock around Fields and Carmelo, particularly with Chandler looming under the basket. It'll be a problem against, say, Orlando (tomorrow night's opponent), but the Knicks aren't going to face many teams where this will be a major issue. Not to speak ill of the bulging disk-ed, but doesn't this make the Knicks defense better? When Jeffries comes back, sure. Remember, Linsanity was fueled by defense more than anything else, and having both Jeffries and Chandler in the paint defensively — which Stoudemire's absence forced — made the Knicks double daunting on that end of the court. When Jeffries returns, you could be looking at a Novak-J.R. Smith/Jeffries offensive/defensive split at the end of games that could be scary to deal with. Jeffries and Chandler are two of the best defensive players in the NBA. Coach Mike Woodson, with Amar'e out, will make sure he uses both heavily. You won't see people breezing past the Knicks's power forward like they regularly did against Amar'e much anymore. Man, it still hurts to watch that. During last year's playoffs, the Knicks learned just how valuable Amar'e is on offense, and how few scoring options they have when he's out. (Like he was, with that same back issue.) The Knicks have more scoring options than they did last year, but Amar'e really had been coming on of late, and the Knicks' offense was motoring accordingly. (Amar'e's scoring push made Carmelo's recent offensive struggles less of a problem.) You saw last night just how out of sorts the Knicks' offense is when Amar'e isn't picking-and-rolling or dropping elbow jumpers from the wing. He might be getting older, he might not play defense, but the Knicks need him. The looks on the faces of his teammates last night left no question. 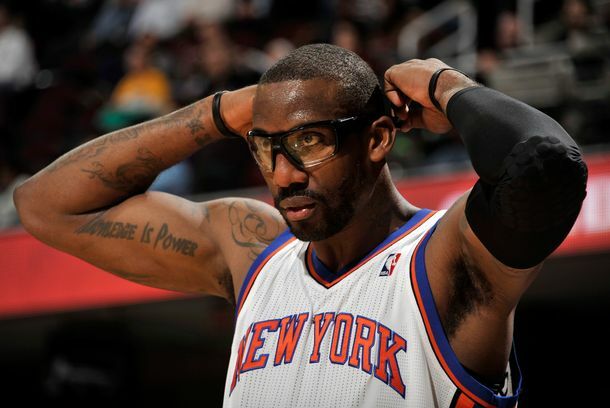 If Amar'e isn't back this year, this is going to remain a problem, isn't it? To quote the great John Schuhmann, yes: "Beyond this season, the facts are this: Stoudemire is owed $65 million over three years. His contract is uninsured. And he’s suffered two back injuries in the last 11 months. The Magic 8 Ball says “Outlook not so good.” Before you ask… No, the Knicks can’t use the amnesty clause to waive Stoudemire this summer, because they used it on Chauncey Billups in December. And no, there isn’t a team out there willing to trade for that contract." This is to say: Amar'e and his back are not going anywhere. But if he's back in a week, we'll all look awfully silly worrying about all this, won't we? If he's back in a week, we don't care how we look. So it all comes down to 'Melo again, doesn't it? The Knicks suddenly only have one elite scorer, one who leveraged his power to get rid of a coach and make the team his. Now the Knicks need his scoring more than ever. It comes down to Carmelo. It always does.